Add quadrature encoders to your micro metal gearmotors (extended back shaft version required) with this kit consisting of two sensor boards, two 3-tooth encoder wheels, and two 5-tooth encoder wheels. 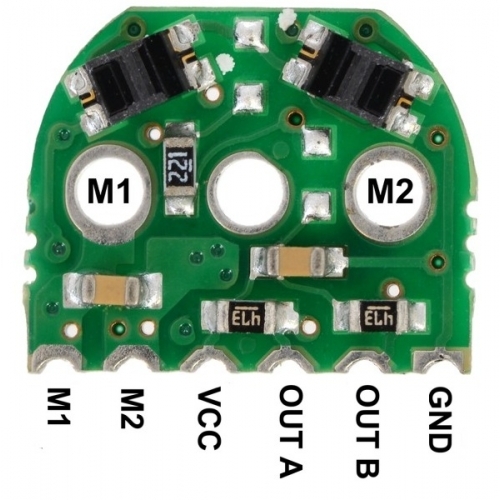 The installed system does not exceed the 12 mm × 10 mm cross section of the motors and extends only 5 mm beyond the plastic motor end cap. The 3-tooth wheel provides 12 counts per revolution; using the 5-tooth wheel yields 20 counts per revolution. 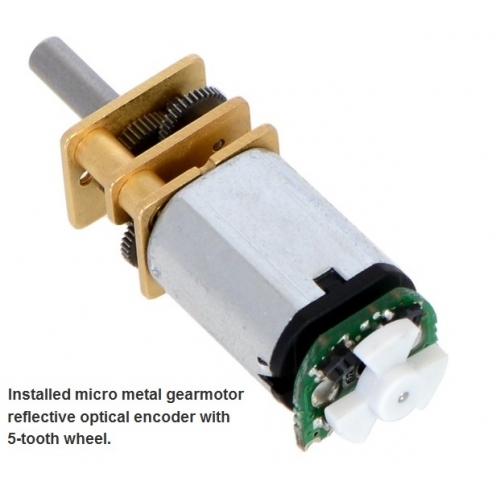 This version is intended for use at 5 V.
This set includes sensor boards and reflective wheels to add quadrature encoding to two micro metal gearmotors with extended back shafts. 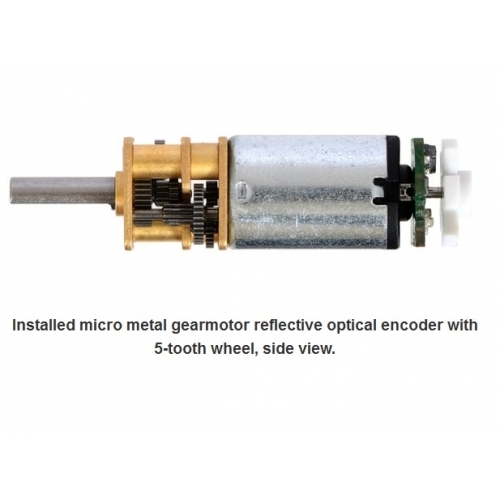 3-tooth and 5-tooth encoder wheels are included to provide options of 12 counts per revolution and 20 counts per revolution of the motor shaft (to compute the encoder counts per revolution of the gearbox output, multiply by the gear ratio). 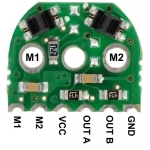 Because the encoder board outputs are direct phototransistor outputs, some signal conditioning is often necessary between the sensor and a digital system processing the signals. 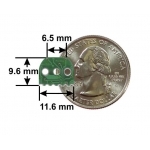 Note: This sensor system is intended for relatively advanced users comfortable with the physical encoder installation and with using the resulting signals. It only works with micro metal gearmotors that have extended back shafts. Once the board is soldered to the motor, the plastic encoder wheel can be pushed onto the motor shaft. 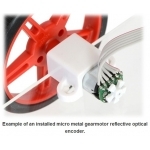 The encoder wheel should be pushed on far enough that the gap between the wheel and sensors is approximately 0.5 mm. 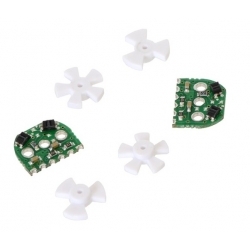 One way to get consistent gaps is to use a few sheets of paper or a business card as a shim when installing the encoder wheel. 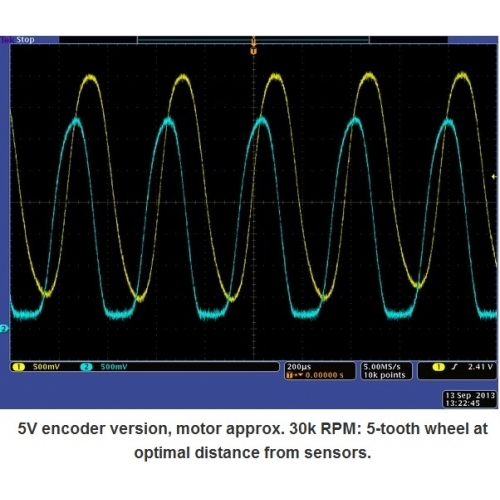 The best way to confirm optimal placement of the encoder wheel is to look at the signal with an oscilloscope. The following screen capture shows the output for a 5-tooth wheel spinning at approximately 30,000 RPM. 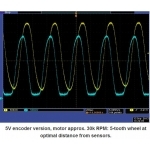 The oscilloscope capture above shows what the signal outputs look like with the wheel mounted at an optimal distance from the sensors. Note that even in this optimal case, the signals from the two channels are different due to inherent variations in the two reflectance sensors, but both signals are 90° out of phase and both span a large voltage range. With the appropriate signal conditioning (e.g. comparators with hysteresis), all of the outputs, except perhaps for the last case, would still yield reliable position counts. 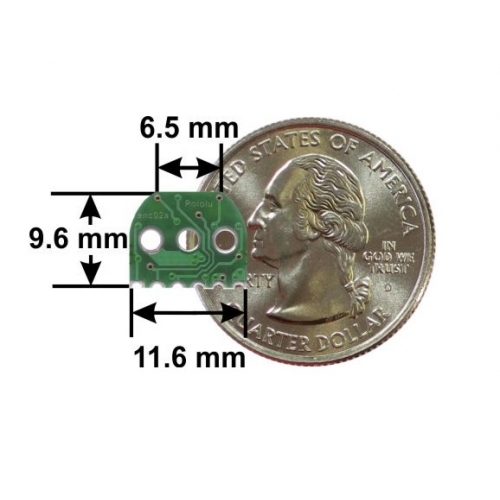 The outputs also tend to improve at lower speeds and with the 3-tooth wheel.